Leaders of the cross-party campaign that convinced the British people to leave the EU have dropped their pre-referendum promise of a £350 million a week for the NHS. A home office report revealed that police records showed a 41% increase in hate crimes in July 2016, compared to July 2015. The Pound fell to its lowest level against the dollar since 1985 on October 4th, 2016. Sterling fell to $1.2775 against the dollar due to speculation about a hard-Brexit. On 17th, January 2017 Prime Minister, Theresa May, announced her 12 point plan for how she envisages Britain to leave the EU. Key points included pushing for the “freest possible trade” with European countries, and acknowledging Britain has to forfeit it’s “membership of the single market”. Self-funded Gina Miller successfully spearheaded the first challenge for Article 50 to be triggered by Parliament. Despite an appeal by the government, the result was upheld by the Supreme Court on 24th January 2017. Nonetheless, Brexit does not need approval from Scottland, Northern Ireland or Wales. 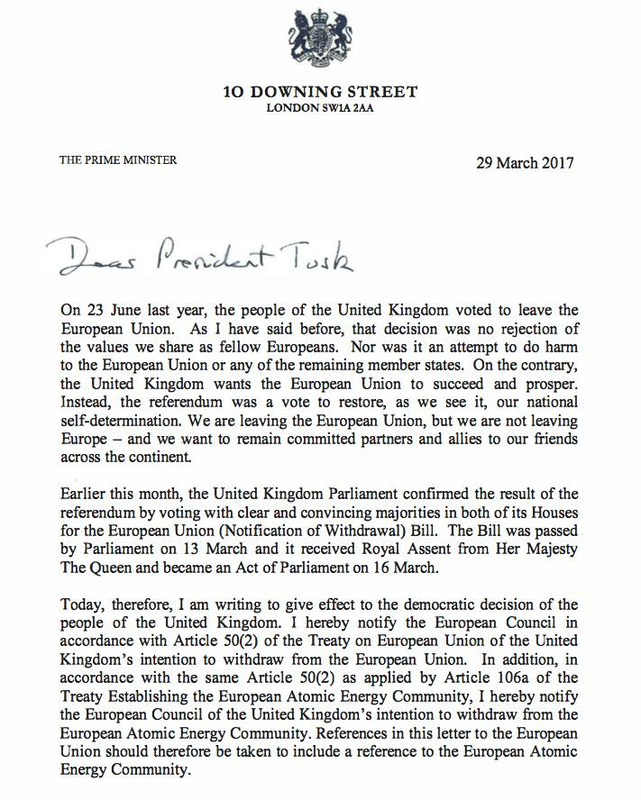 On 29th March 2017 Britain officially started the two-year time limit for leaving the European Union. On 22 June 2017, Prime Minister May promised that no EU citizen living legally in the UK would be forced to leave, conditional on the EU providing the same offer to British expatriates living in the EU. May’s Florence speech was the first insight into how much Britain are willing to pay to leave the EU, with the amount being around £18 billion. Yet this has increased and is now around £37 billion. In December 2017, EU leaders announced an agreement to begin the next phase of negotiations, with talks on a transition period after March 2019 to begin in early 2018 and negotiations on the future UK-EU relationship, including security and trade to start in March 2018. On 8 May 2018, the House of Lords voted to make remaining in the European Economic Area a negotiating target meaning that Britain may not leave the EU’s single market. The annual EU summit will take place in October 2018, where 20 out of 27 members can accept or reject the UK’s Brexit deal. This year will see discussions heat up, for the countless numbers of both ‘leavers’ and ‘remainers’ who feel betrayed, alienated or simply concerned about the fate of Britain, I urge them to contact their MPs and make their concerns known. It’s Official Trump is President, So What Now?